This Lifetime shed adds a whole new level of convenience with the newly redesigned roof panels which now include 2 large dome skylights. 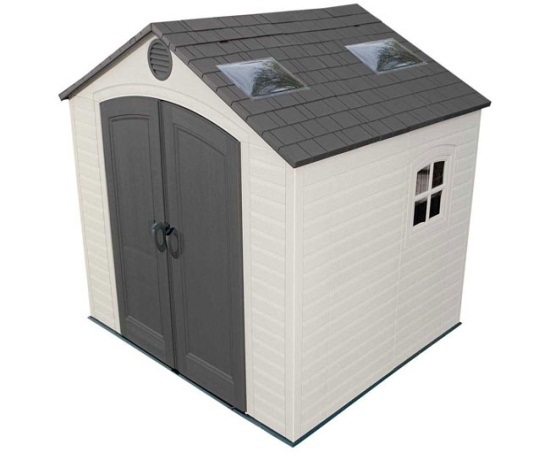 As with other Lifetime sheds, the 60015 features a polyethylene plastic roof, walls, and flooring. 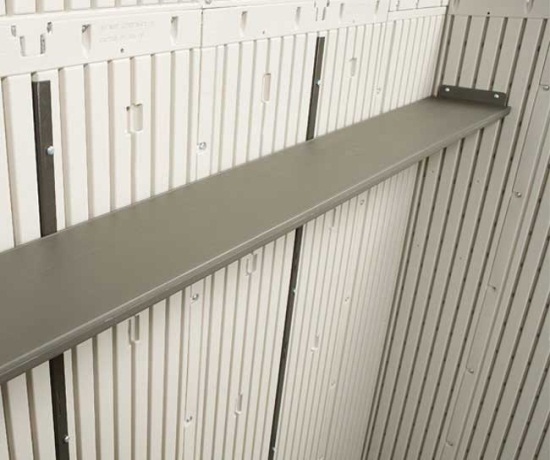 The walls and doors are steel reinforced for added rigidity and stability. 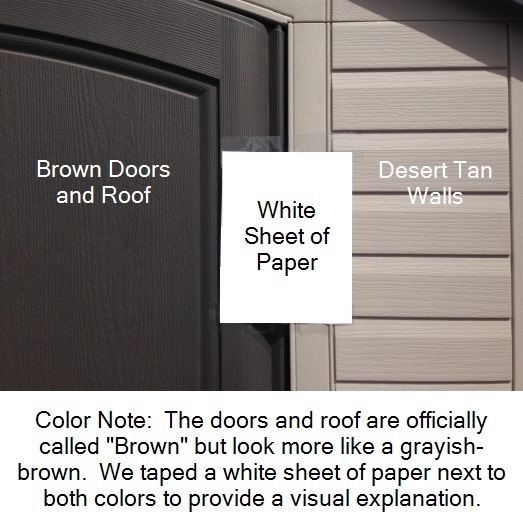 The plastic material features a wood-grain impression, giving the storage shed an appealing wood-like look while giving you the life and low-maintenance of plastic. Wall material of construction: polyethylene plastic. Walls of this outdoor shed are steel reinforced. Wood grain pattern gives this storage shed a beautiful wood-like appearance. 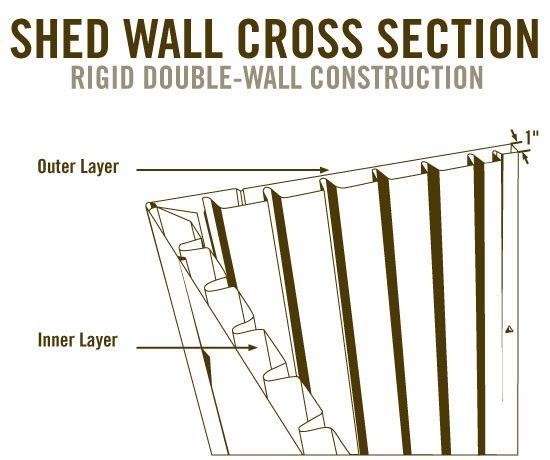 Walls are treated to be fade-resistant, even after extended exposure to the sunlight. 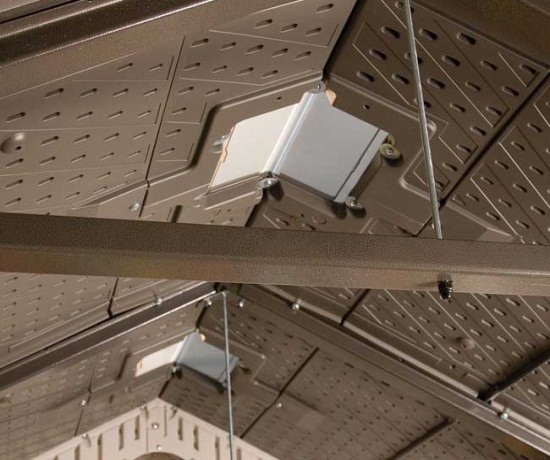 Lifetime storage shed roof is structured with steel trusses. Snow load: 23 lbs. per square foot. Lifetime shed roofs are designed to give the appearance of shingles, giving the shed an attractive look. Roof has a steep pitch to assist in water drainage and snow removal. Roof features 2 large skylights and 3 small skylights to allow lots of natural light into the shed. Doors are steel reinforced to provide rigidity. The 60015 shed door has an internal spring latch. Doors have interior dead bolts. 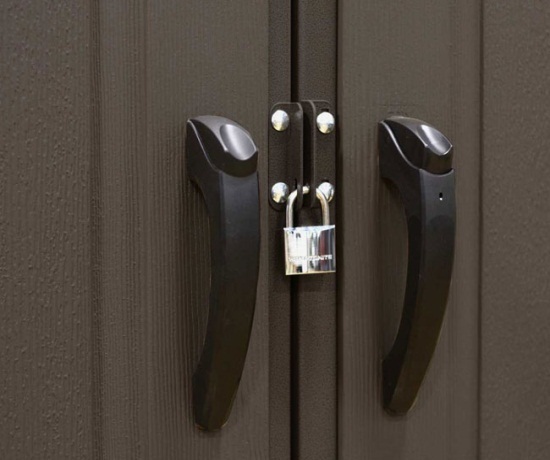 Lockable using exterior padlock loop. Plastic Shed floor is resistant to oil, solvents, and other stains. 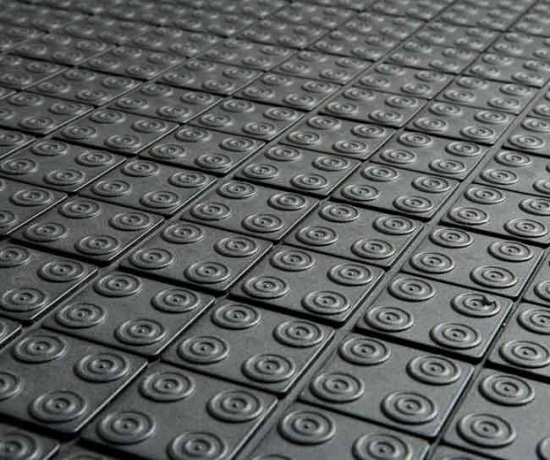 Plastic storage shed floor is textured to make the floor slip resistant too. 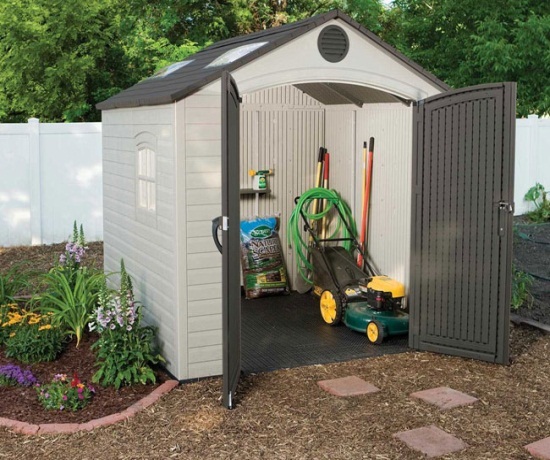 The 60015 Lifetime storage shed includes a 10-year factory warranty from Lifetime Products. The 60015 Lifetime shed includes 2 large skylights and 3 roof-ridge skylights. 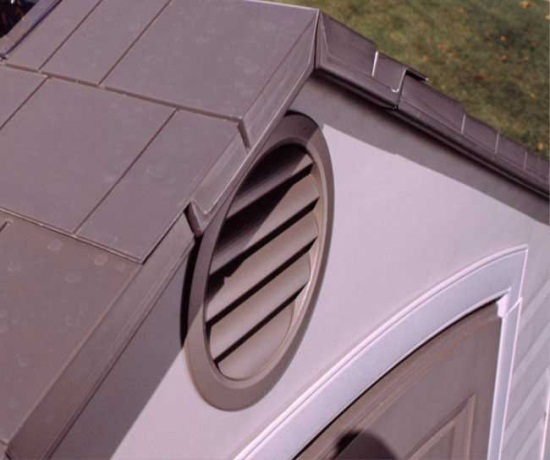 Two screened vents on either end of the shed help to ventilate the inside of the shed. 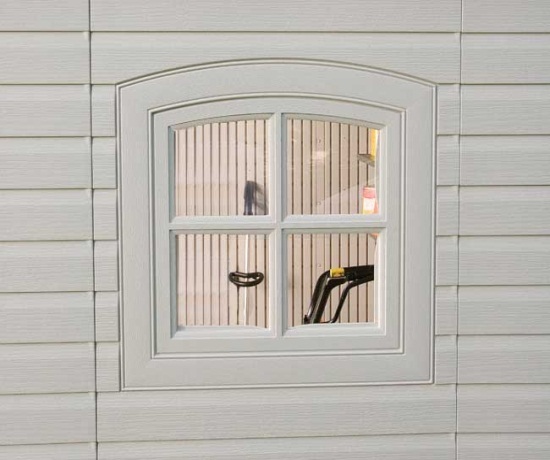 There is one additional window on the side of the shed that can be opened halfway to increase airflow in and out of the shed. 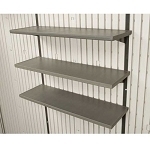 Immediately start to organize your shed with the included 90x9 inch shelf. Make sure you check your local zoning laws and ordinances before ordering. Nominal Dimensions - 8 x 7.5. Footprint - 94 inches w x 88 inches d.
Exterior Depth - 85.5 inches. Exterior Roof Depth - 90 inches. Interior Width - 90 inches. Interior Depth - 84 inches. Square Feet - 52.5 square feet. Cubic Feet - 362.0 cubic feet. Roof Support Trusses - Two (2) Steel A-Frame Trusses. Window - Two (2) 16.5 inches w x 16.5 inches h Polycarbonate Window - Opens Half Way. 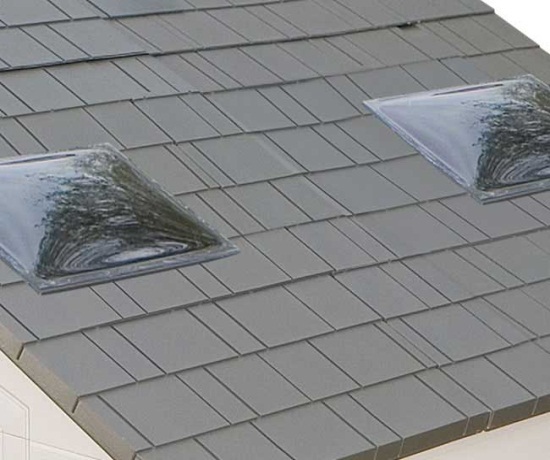 Included Skylights - Three (3) Polypropylene Skylights on roof ridge, two (2) large dome skylights. Two (2) tool peg strips with tools cook for additional storage. 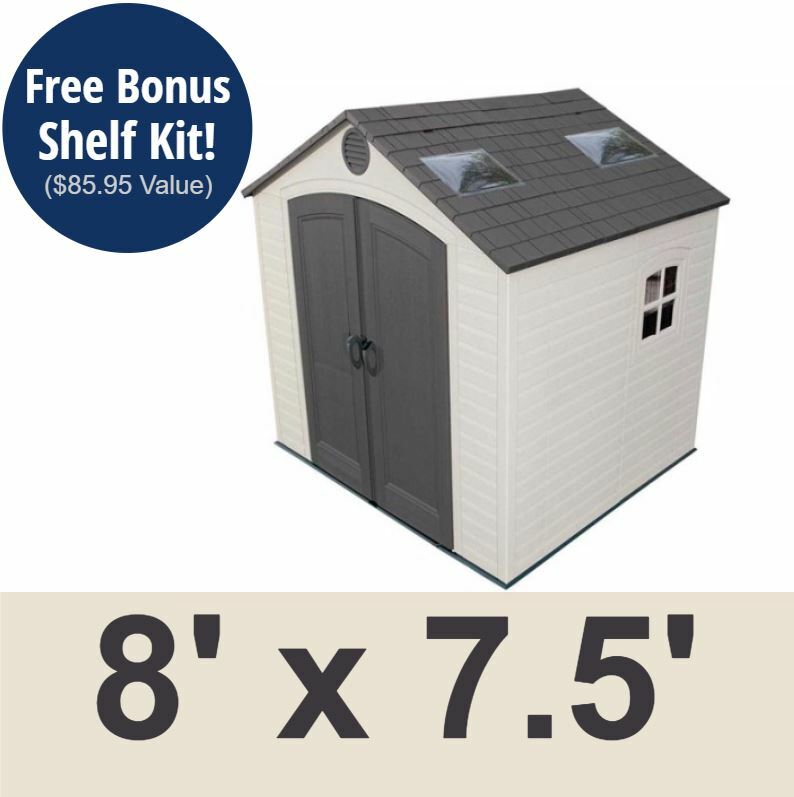 Includes Shelves: One (1) 90 inch W x 9 inch D.
Please note that this shed is non-extendable using Lifetime shed extension kits. The skylight on the ridge of the roof make the extension kits not compatible with the 60056 storage shed. I went to buy a gazebo, love being outside, in most weather. When my son saw the shed, he thought it was perfect for what I wanted. It has floor, window, and sky lights. At 64 years old I have my own play house. I have chairs, cable, and TV. Love it! I recently purchased the 8x7. 5 LIFETIME storage shed from a [local vendor]. It comes in two large boxes requiring a full size pickup to transport. After getting it to my home we began to unpack the contents of the two large boxes. Inside we found many parts and the large plastic panel that make up the shed. Site selection is very important to ensure a level assembly surface. My family and I spent a Saturday assembling this well built storage shed. After completion I was very pleased with the quality and size of this unit. I would be happy to recommend this to any of my friends as it is good quality and delivers on what is expected. Well done LIFETIME! Very thorough and easy-to-follow instructions. The shed feels sturdy and I am confident it will hold up over the years. The kit is generous in providing even more than the bare minimum for assembly. For instance, it provides some certain tools, a block of wood to use while snapping the walls into place and even wood shims for leveling. Q: I'm offered 10 % discount at both Home Depot and Lowe's since I am a military service veteran - do you offer such discount? A: Please click on the instruction tab below the picture for a copy of the instructions. Q: What unique things do you need to know about this shed? 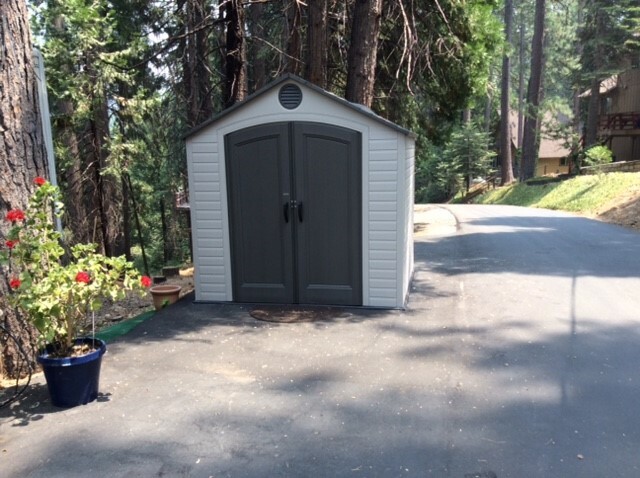 A: This shed is the largest Lifetime outdoor garden shed you can get without voiding the 10-year warranty from Lifetime Products. 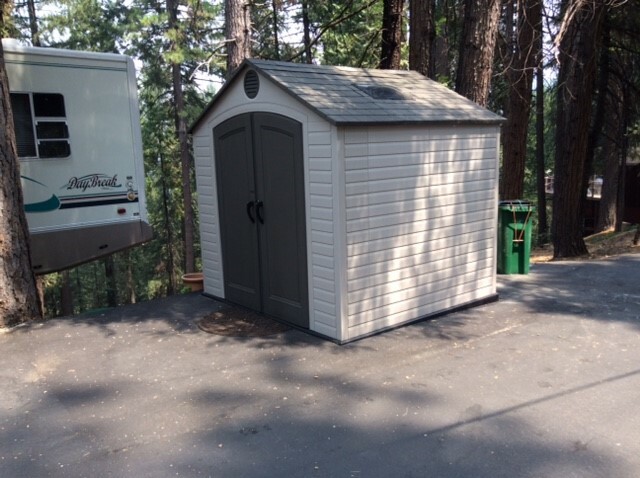 While the shed can be extended beyond the 15 ft. length, but the product will no longer be covered under warranty. A: Yes, we can ship this item to Canada. However, as our cost to do so is very high, Canadian customers are frequently able to get the product across the border cheaper than we can. If you have a United States address we can ship to, you will typically save money bringing it across the border, paying the required fees, than for us to ship directly to you. Shipping costs on the shed is noted in the "Check Ship Rates" link at the top of the listing. Please note that these videos are meant to provide general information for this product and have been created by individuals that have owned or used this shed. The details of the 60015 are listed on our website listing. Please do not use specific details from the video to know what comes with the 60015. Regarding Shipping. Orders for the 6446 Lifetime Shed generally leave the warehouse within 2 business days. This product ships directly from Lifetime Products in Clearfield, UT. Delivery of this product is via a curbside delivery through an ltl carrier. The customer must be present to sign for the package and move the boxes where they need on the delivery property. Delivery appointments are scheduled through the delivery company before delivery is attempted. The customer can either contact the freight company themselves once they have the tracking number, or they can wait for the freight company to contact them to schedule the appointment. Ltl freight carriers will frequently have some flexibility with scheduling delivery once the product is at the delivery terminal within 7 days (not business days) of the item arriving at the terminal. The terminal can hold on to the item longer than that as well, but they will begin charging storage fees to the customer after 7 days of the product sitting at the delivery terminal. Call or email us with any questions. Please note that the driver will not assist in moving the packages anywhere on the delivery property. To help you prepare for this delivery to make sure you have sufficient help, below are the shipping dimensions and weights for the 6446 shed. Box 1 is 95.313 inches L (242.095 cm) x 32 inches W (81.28 cm) x 9.625 inches H (24.448 cm), 235 lbs. Box 2 is 95.313 inches L x 32 inches W (81.28 cm) x 10 inches H (25.40 cm), 165 lbs. Dimensions: 96" x 39" x 20"